New Delhi, Apr 11 : The north-east region has been facing a milk shortage and falling short of its production targets, mainly because of the continuing smuggling of cattle into Bangladesh. Tripura Chief Minister Manik Sarkar recently blamed the falling milk production targets on the cattle smuggling across the border. “Smuggling of cattle into Bangladesh is a major hurdle before achieving the target of milk production in Tripura,” Sarkar said in Agartala at the inauguration of a new dairy plant. He noted that the fencing along the border has only reduced the smuggling, but not put an end to it. Compounding the state’s milk crisis is the fact that cattle breeds cannot be imported from other parts of India, owing to the special climatic conditions there. “Because of the unfavourable tropical condition and other problems in Tripura, breeding of Australian and other foreign cattle are also not viable,” he said. More than two million cows are smuggled from India to Bangladesh, along the entire land border, apparently with the help of security officials. 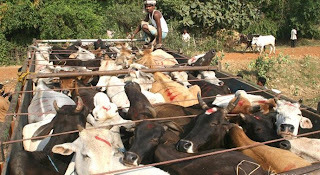 Three out of four cows killed in Bangladesh slaughter houses are from India.